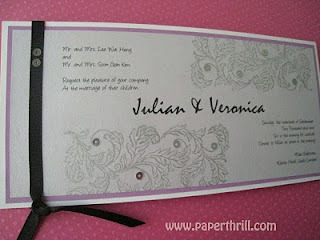 For those brides who want something modern and contemporary, this handmade wedding invitation is absolutely perfect. The contrast of colours between the bold black and sweet lilac goes together in a very interesting way. Silver ferns are handstamped on opposite corners on a very pale lilac pearlescent paper. Small round silver sequins are added for sparkly effect. 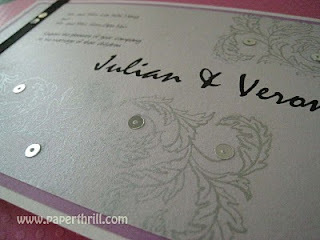 Then, a brighter lilac coloured cardstock is then layered between it and a pearlescent white cardstock. 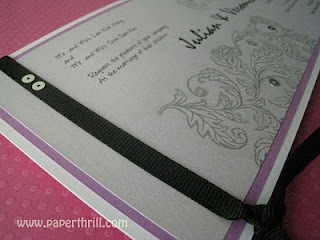 Lastly a black grosgrain ribbon is tied around the wedding card.